Illinois Innocence Project (IIP) exoneree Charles Palmer and his wife Deborah stand as IIP Executive Director John Hanlon accepts the Joe Slaw Civil Rights Award from the NAACP Decatur Branch. Photo by Dennis Rumme. 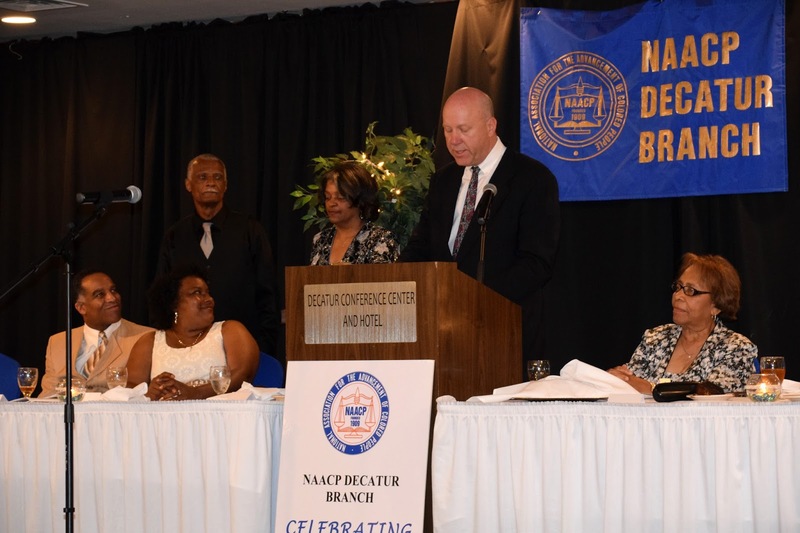 The Illinois Innocence Project at the University of Illinois Springfield has been honored by the NAACP Decatur Branch with its prestigious Joe Slaw Civil Rights Award. The award was presented during the 77th Annual Freedom Fund Banquet and 4th Annual Game Changers Awards Ceremony at the Decatur Conference Center and Hotel on May 27, 2017. In November 2016, the Project was instrumental in the exoneration of Charles Palmer, a Decatur resident, who was wrongly convicted of a 1998 murder and imprisoned for 18 years for a crime he did not commit. The Illinois Innocence Project successfully litigated DNA testing of an unknown person’s tissue, which was found under the victim’s fingernails, and another person’s hair in his hand. Both samples went untested prior to trial. Upon testing by the Illinois Innocence Project, both DNA samples were found not to match Palmer. Since its founding in 2001, the Illinois Innocence Project has helped to free 10 wrongly convicted individuals. The Illinois Innocence Project is dedicated to releasing innocent men and women imprisoned in Illinois for crimes they did not commit. They research and investigate claims of innocence and provide legal representation and other assistance to prove credible claims of actual innocence. The Project reviews more than 300 requests for help from Illinois inmates each year. Undergraduate students at the University of Illinois Springfield and law students from the state’s three public law schools work with IIP attorneys to review, evaluate and, where strong evidence of actual innocence exists, investigate and legally pursue claims of innocence.